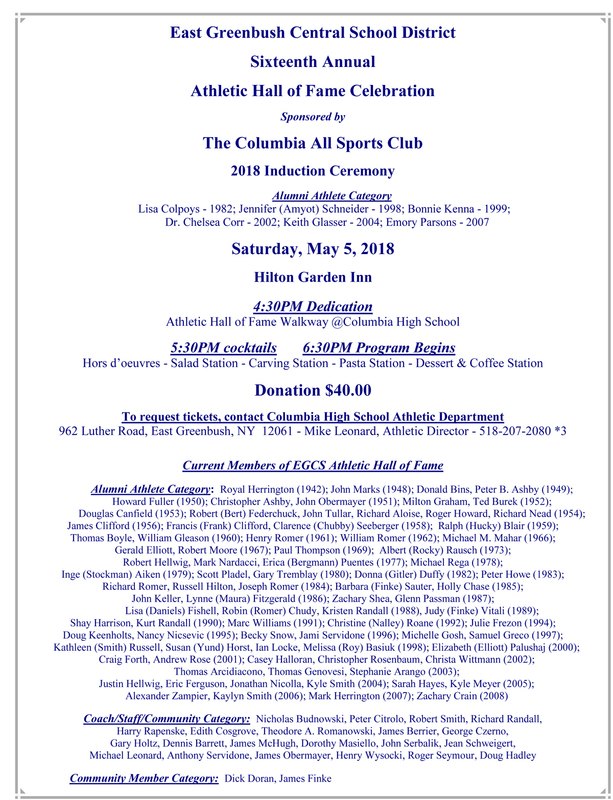 Six alumni will be inducted into Columbia High School’s Athletic Hall of Fame on Saturday, May 5. The event will begin with a dedication ceremony in Columbia’s Athletic Hall of Fame Walkway at 4:30 p.m. before dinner and the program at the Hilton Garden Inn in Troy. Congratulations to the Class of 2018 Athletic Hall of Fame members! To request tickets to the Athletic Hall of Fame Celebration, contact the Athletic Department at 518-207-2080 ext. 3. This event is sponsored by the Columbia All Sports Club.